Bead jewellery is highly fashionable and preferred by fashion and style lovers all over the world for their diversity and uniqueness. They come in all shapes and sizes with glowing or matte superficial properties. Our store features a rich series of bead jewellery made with excellent artistry and exquisite workmanship to bring to you a product of ultimate quality and standard. Uniqueness is one major factor that is taken into consideration when designing an accessory. We have adopted the same policy when designing our series of bead jewellery. Being rather classy and conventional, we create value on our products with elegance and subtle beauty. Our bead jewellery collection boasts finest quality necklaces, bracelets and pearl brooches, which are all meticulously designed with care to make sure each and every accessory is up to the quality standard we maintain. We do not tolerate flaws in our designs since we are dedicated to offer our customers only genuine products. We create value in providing our customers with best quality products. In our belief, a satisfied customer is the basis for success. We offer a series of highly diverse bead jewellery for you to select form a range of different colours, shapes and designs. These are universal accessories, which you can wear for both formal events and casual occasions. Polished beads are highly reflective that they can emphasize bodily features and their beauty. 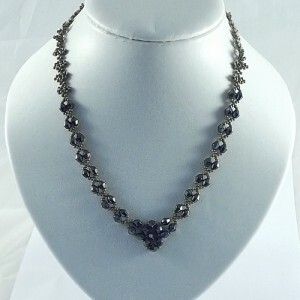 In addition to that, dark bead accessories are rather conspicuous and can bring more attraction to you making you look more outstanding in any occasion. Their uniqueness will astound you and make them feel more personal. Accessories a person wears reflect his or her attitude and emphasize them. Wearing classy bead jewellery will show off your unique beauty with an added elegance. Bead jewellery is definitely an excellent gift idea. Jewellery gifted is a precious memento to keep in heart forever. Gift your lover a stunning bead necklace on a special occasion to prove your love for her. Beads symbolize preciousness and purity. There isn’t a more romantic gift to make your lover feel loved and cared. Among other things, despite their glossy and attractive nature, bead jewellery costs less than most other jewellery accessories. For the money you pay, these items are all worthy. Add to your personal collection a couple of bead jewellery to experience the difference. High quality bead jewellery accessories are available at very affordable prices.